Meadowridge School is proud to announce the results of our first IB Diploma and Course exams. The Class of 2014 achieved a 100% success rate, compared to the 2013 world average of 80% pass rate. 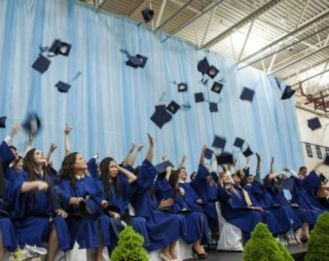 The Diploma Candidates received 33.1 points on average, above the world average of 29.5 points. The Meadowridge Course candidates earned the best marks in the history of Meadowridge School, and the first cohort of Diploma students exceeded expectations, and also recorded the highest marks in school history. Projected marks were very accurate, and all of the students retained their university choices and scholarships – to some of the best universities and institutes in the world. As a school and community we are very proud of these results, but are perhaps more proud of some of the less measurable characteristics that our school values, and that our graduates display: Thoughtfulness, inquiry, intercultural understanding, balance, leadership, risk-taking and caring. In many schools, only the very top students are allowed to write DP exams. At Meadowridge, every student wrote them, and did well. Congratulations to the Meadowridge School Class of 2014! For more information, visit http://www.meadowridge.bc.ca/page.cfm?p=546.